The DFDS terminal at Dunkirk is substantially altered and the little area where one could park for the night, waiting for the next boat is no longer there. The check in area is surrounded by high razor wire fences and looks like a POW camp. I wonder why? Close by is an alternative, 15-20 mins drive, at St Pol de Mer. The Bourne is located in one part of town and the Aire in another. Although there was a sloping parking area in front of the Bourne. A nice little Aire to break the haul to the docks from southern France. It is between the Marie and the Pompiers. Only 6xP and the bays are narrow but foc. If your neighbour snores you will hear him! The Bourne is also foc, but no longer provides ehu. The walk around the park surrounding the Marie is most enjoyable. 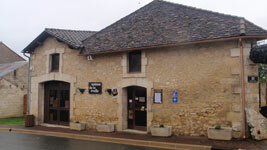 Another small attractive village with Templar connections. The small Aire, behind the school is foc, a little unlevel and the Bourne requires a jeton, available from local shops. Bourne on a Circle, down near Lidl. No provision for CC parking. Aire down by the river and close to the cathedral. Not really a place to overnight, but roadside parking for CCs near this famous attraction. A welcoming place for CCs. New Aire for 30, each with EHU. Park all day for nothing, nights $5. The Bourne is foc but the water pressure is high and requires a male/male adaptor. The Maison Fort built into and part of the cliff side is an interesting place to visit. There is an area set aside for CCs next to the river. Overnights OK but no services. Just down the road from Bergerac was this very nice lttle Aire at Caudeau The schools cockerels would wake the dead but the Bourne was adequate and foc. 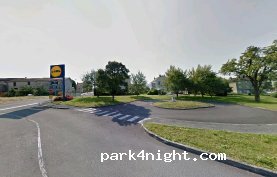 A new Aire on the outskirts of town and next to a park. Barrier entrance to Aire with EHU, $7 + $3. 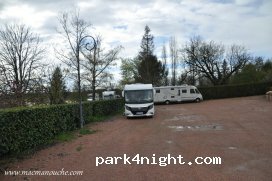 The coach park is available at this Loire type, hill top château. 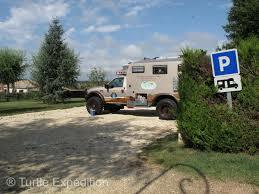 Behind the Pompiers rest area on the outskirts of this excellent town to visit. We were running out of time so parked up for the night opposite the Bourne at the Intermarche. Quite handy as there was a Laverie as well.